This is a review on Grandelips Hydrating Lip Plumper, a product that delivers true plumping power, according to the manufacturer. However, can this product live up to this bold claim? We shall examine the product formula as well as customer service provided by Grandelips to help you decide if this product is a wise purchase choice. There are very few active ingredients included in this formula, with most ingredients being binders and thickeners which appear at the front of the ingredients list (such as Polybutene, second from the top). Only a few of those have the ability to condition skin, but add no actual value in plumping lips. These include Octyldodecanol (which is primarily a fragrance) and Silica Dimethyl Silylate (which is primarily a thickener). Caffeine is used to stimulate blood flow to the lips. Phenoxyethanol is next on the list (an ingredient banned in Japan) which offers no actual benefit but is thought to be harmful when absorbed through the skin; resulting in nausea, headaches, depression, and even reproductive damage to name a few. Then, right at the end of the ingredients list, we find Hyaluronic Acid and Volulip. Hyaluronic Acid is known to promote hydration and firmness while Volulip is a patented ingredient used to soften skin and increase volume. While its pleasing to see the appearance of a patented ingredient, it is last on the ingredients list. Competing brands have up to 5 patented ingredients including Volulip as well as collagen-boosting Trylagen PCB and firming Syn-Coll. In saying so, this product is likely less effective than competing brands on the market. It is positive to see that this product is vegan; cruelty-free; and free of gluten, parabens, and Phthalates. However, this product is lacking a GMP certification, which suggests that market-standard processes where not used during production. The product comes in an applicator and the bottom must be twisted/ clicked to fill the applicator with the product. Then, apply the product directly to lips either alone as a gloss or with other lip products. The product comes in 13 colors to choose from, including clear shine. There is no suggestion as to how frequently the product should be used. We are uncertain of the efficacy of this product as the manufacturer does not disclose the concentration of the active ingredients. Although, since they are at the bottom of the ingredients list, we are not convinced. Grandelips Hydrating Lip Plumper can be purchased online from the manufacturer’s website. A 2.4ml tube retails for Price $27.00, which is somewhat expensive, considering the lack of discounts and bilk offers available. The manufacturer offers a substantial 90-day period in which products may be returned for a full refund. While this may seem to inspire confidence in the product, especially since partially used products still qualify for a full return, this cannot compensate for the limited amount of active ingredients included in the formula which most definitely have an impact on efficacy. There are many customer reviews online that complain that the product was ineffective and that the packaging gave them issues. 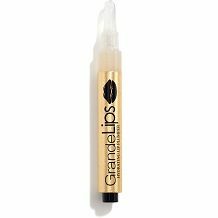 Grandelips Hydrating Lip Plumper claims to deliver true lip plumping power, and you start to believe it when you read about the key ingredients included in the formula that has been proved to be effective in supporting plumper and more hydrated lips. However, upon closer inspection, we saw that these ingredients were last on the formula list and surpassed by many inaction binders and fillers. The addition of potentially harmful Phenoxyethanol was also a great concern. There are no other patented ingredients or GMP certification, raising concern as to the actual quality of this product. The price is relatively expensive and although the guarantee is extensive, it appears to be overcompensating for a poor formula. For these reasons – and the many negative customer reviews – we do not recommend this product as a wise purchase choice.